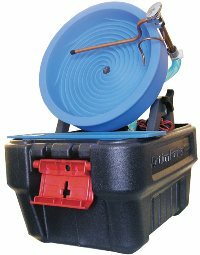 Pro-Camel 24 Spiral Gold Panning Machine - FREE SHIPPING! The Pro-Camel 24 Automatic Gold Panning Machine (24″ Spiral Wheel) is the big brother of the Desert Fox Automatic Gold Panning Machine. This large 12 volt panning machine was introduced to the mining community in 2009 and has received rave reviews since its release and is known as one of the top fine gold recovery systems on the market today. It is a fast, high capacity machine capable of processing up to 400 pounds of placer sand per hour! This machine is for the miner who wants to process a lot of concentrates in a short time. Saltwater can be used if you give the machine a fresh water rinse at the end of the day. 15 spiral leads into a 5 lead second stage on a big 24″ wheel. Exclusive Aqua-Jet on the spray-bar churns and mixes the materials in the wheel for the fastest recovery possible. 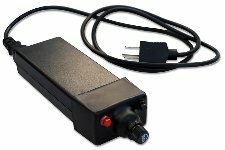 The PRO-CAMEL features a variable speed control. Standard drive unit is gear driven and ball bearing equipped. It runs smoothly, quietly and is energy efficient. 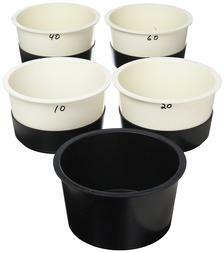 The Pro-Camel 24 uses the same basic principles as panning for gold by hand, but much faster and more efficiently. 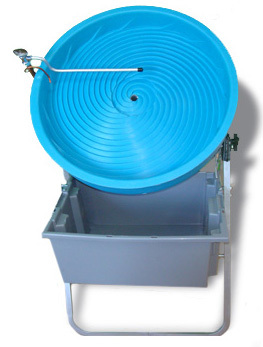 The Pro-Camel’s Aqua-Jet provides an ample water supply to the edge and bottom of the spiral wheel to create the slurry needed to allow the gold to separate from the other material. As it does, the gold is scooped up in the 15 spiral riffles and stays there because of the deep “V” design. As the wheel turns, the spray bar rinses the lighter material away allowing the gold to ride up the spirals. When the gold drops into the second stage, any material tagging along for the ride is washed away allowing the clean gold to be deposited through the center hole of the wheel and into the gold catch cup hanging on the back of the machine. When the base material is properly classified, meaning the relative size of the material being processed is the same, the Pro Camel 24 works just as well on recovering fine gold as it does on pickers and flakes! If you only need an 18 inch spiral wheel, check out the Pro Camel 18 here. This machine ships FREE via UPS to continental USA. Additional charge to Alaska. 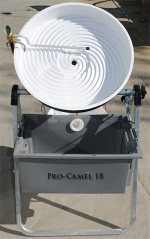 Pro-Camel 18 Spiral Gold Panning Machine - FREE SHIPPING!